"This evening, Hayman Capital through the entity "Coalition For Affordable Drugs" filed a petition for Inter Parties Review on a patent controlled by Shire PLC. Importantly, the patent in question supports Shire's very profitable drug LIALDA, which according to Shire's most recent investor presentation generated $634 million in sales in 2014, up 20% year over year. Shire has initiated infringement cases concerning Patent #6773720 on numerous occasions over the past few years against generics that target the same health conditions in which LIALDA is prescribed to treat." "For the reasons given, it is ORDERED that, pursuant to 35 U.S.C. § 314(a), inter partes review is instituted as to the ground of unpatentability that claims 1–4 of the ’720 patent would have been obvious over Groenendaal (Ex. 1005) and Leslie (Ex. 1003); FURTHER ORDERED that inter partes review commences on the entry date of this Order, and pursuant to 35 U.S.C. § 314(c) and 37 C.F.R. § 42.4, notice is hereby given of the institution of a trial; and FURTHER ORDERED that the trial is limited to the ground of unpatentability listed above, and no other ground of unpatentability is authorized for inter partes review." One of the main focal points of discussions in the distressed world the past two weeks has been the shocking Nortel allocation opinion that moved bond prices precipitously over the past few weeks. So many funds were affected and Reorg has spent many many hours talking with clients and going through the exercise to see how this opinion will affect recoveries, process, etc. Last night the U.S. debtors as well as the ad hoc bondholders filed motions for reconsideration of that opinion. I've reproduced the Reorg Research story in full below. Enjoy! On Tuesday night, four U.S.-based parties filed motions asking Judge Kevin Gross to reconsider hisdecision in the $7.3 billion allocation dispute that tanked bond prices and left market participants grappling with follow-up questions. The motions for reconsideration all claim that clarification is needed in order to prevent the allocation decision from producing inequitable results. The motions for reconsideration include illustrative lockbox recovery estimates but also focus on the larger legal ramifications of the allocation dispute. Many of the motions take issue with the fact that bondholder guarantee claims against the U.S. estate have been already been quantified and allowed against various U.S. entities, but under the allocation decisions, such claims are not allowed to be factored into the claims pool being asserted with respect to the “pro rata” sharing. The ad hoc group of bondholders argue against any reading of the plan that does not allow them to assert the full value of their claim against guarantors. The bondholders say this provision would conflict with existing case law on the legal right to assert guarantee claims. The NNCC bondholders take a different tack entirely, arguing that without substantive consolidation, each debtor estate and its claims pool should be counted independently with respect to the allocation of sale proceeds. The U.S. debtors also support this argument. All of the motions for reconsideration are scheduled to be heard on June 30 at 10 a.m. EDT, with objections due by June 15 at 4 p.m. EDT. 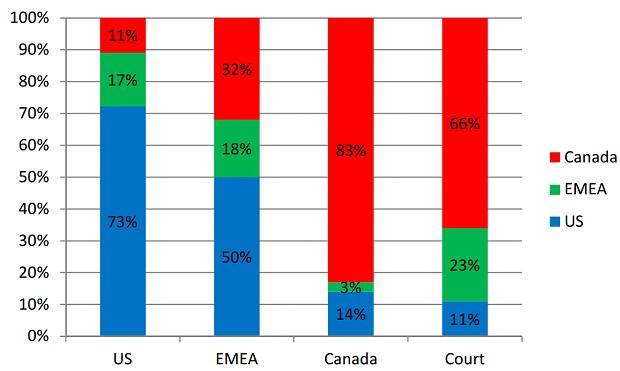 Specifically, the U.S. debtors say, implementing the court’s pro rata allocation method using the assumptions of Thomas Britven, an expert witness of the Canadian Creditors Committee, unsecured creditors of the Canadian debtors would see recoveries at 47 cents on the dollar, with EMEA unsecured creditors receiving 48 cents on the dollar. The allocation to U.S. unsecured creditors, on the other hand, would be only 14 cents on the dollar. In a footnote, the U.S. debtors acknowledge that an allowed $2 billion NNI-NNL claim would add an additional 17 cents to these recoveries, but they state that this is still “far lower” than what other similar creditors will receive. In order to “avoid these inequitable results, while honoring the spirit underlying the Court’s ruling,” the U.S. debtors seek reconsideration on two issues. The first issue is the impact of exclusion of guaranteed bondholders’ claims in the allocation formula. The second has to do with the NGS/Diamondware allocation. On the exclusion of guaranteed bondholders’ claims, the U.S. debtors write that the effect of the Court’s decision on this matter “has the effect of severely depressing the amount of Lockbox proceeds available for distribution to general unsecured creditors holding claims solely against the U.S. debtors” relative to allocations made available for creditors holding claims solely against either the Canadian and EMEA debtors. On the NGS/Diamondware allocation, the U.S. debtors say that the court’s decision not to allocate to the U.S. debtors any of the lockbox proceeds attributable to the sale of NGS and Diamondware is inconsistent with the fact that other debtors have sold “material subsidiaries for substantial sums” but are able to retain the proceeds from such sales. These include, for example, the proceeds from NNL’s interests in LG, which were sold for $242 million, as well as the sale of Netas, an EMEA non-debtor subsidiary, which yielded $83.7 million. Inclusion of reserve for certain claims. Finally, the U.S. debtors ask the court to confirm that it will permit them to receive an allocation in respect of reserved and estimated amounts of claims that arise “solely as a result, and therefore subsequent to, an actual allocation of the Sales Proceeds.” These claims “particularly include” claims for taxes that may arise against the debtors on the basis of the actual allocation and release of lockbox proceeds to the U.S. debtors, the motion states, and therefore cannot be made at this time. These projected recoveries, however, include “more than just the results of the Sales Proceeds allocation and therefore tell only part of the story,” the U.S. debtors say. Given that the pro rata methodology established by the court is intended to divide the lockbox proceeds pro rata for ultimate distribution to creditors, rather than ensure that the total distributions to creditors are made pro rata, whether a particular creditor ultimately receives a greater recovery depends on “factors unique to each Debtor estate,” such as a debtor’s pre-existing cash, allowed intercompany claims, distributions on guarantees and other local law priorities and requirements. For these reasons, the U.S. debtors say, they are seeking the proposed modifications and clarifications to the allocation opinion: “as drafted, neither the Allocation Opinion nor the Canadian Allocation opinion even approaches its intended result: an equitable, pro rata allocation of the Sales Proceeds based on allowed creditor claims,” the U.S. debtors argue. The UCC argues that reconsideration of the allocation decision is warranted “to prevent manifest injustice to U.S. general unsecured creditors  and to correct clear legal error,” adding that while the court “decried the ‘extreme allocation proposals of the various debtors,” its proposed methodology “potentially leads to a result for U.S. GUCs that is even more ‘extreme’ than the Canadian and EMEA Debtor Groups had advocated” (emphasis added). In its motion, like other movants, the UCC stresses that the allocation trial “was to be about allocation of assets, not about determination of claims, and accordingly the parties did not present the Courts with a complete factual record regarding the scope or complexities of their claims.” Considering the nature of the allocation trial, the UCC maintains that the court “could not have apprehended that its methodology would have extreme consequences, and would not represent a middle ground approach, or that the decision potentially causes disproportionate harm” to the U.S. GUCs. The UCC notes that assuming both that “the figures in the publicly-available Britven exhibits, and that the Crossover Bond claim in the U.S. is not taken into consideration for allocation purposes,” both of which are assumptions with with the UCC disagrees, the motion notes that the bankruptcy court’s methodology “produces an allocation of 11% of the Lockbox proceeds to the U.S., 66% to Canada, and 23% to EMEA.” This allocation result, the motion argues, is not “‘fair and equitable’” and instead “results in particularly acute, and respectfully, unreasonable and inequitable damage to U.S. GUCs.” The UCC’s illustrative allocation is reproduced below. The motion also seeks correction or clarification of an apparent typographical error, citing the court’s use of “NNC” in two instances and suggesting that the court likely intended to reference “NNCC” in those instances. This evening, Hayman Capital through the entity "Coalition For Affordable Drugs" filed a petition for Inter Parties Review on a patent controlled by Shire PLC. Importantly, the patent in question supports Shire's very profitable drug LIALDA, which according to Shire's most recent investor presentation generated $634 million in sales in 2014, up 20% year over year. Shire has initiated infringement cases concerning Patent #6773720 on numerous occasions over the past few years against generics that target the same health conditions in which LIALDA is prescribed to treat. Sources indicate that Hayman has raised a dedicated fund for such effort. I personally find this form of activism FASCINATING. The IPR process that Hayman is employing really is on the cutting edge of the intersection of law and finance. IPRs are a very new animal in the world of patent law and I think this is a tool many funds and activists will use down the line given the relatively low cost to file them - and I truly don't think pharma will be the sole target. Every industry really is at risk at this point. Update: Hayman targeted a second patent tonight (7056886) owned by NPS Allelix. Shire announced the acquisition of NPSP in January (http://www.shire.com/shireplc/en/investors/irshirenews?id=1052).